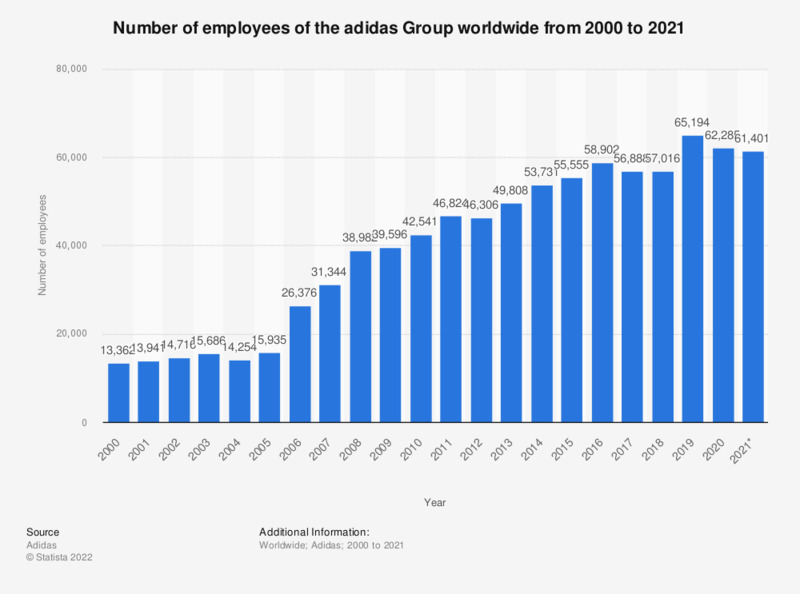 This timeline shows the number of employees of the adidas Group worldwide from 2000 to 2018. At the end of the 2015 fiscal year, the adidas Group had 55,555 employees worldwide. Adidas AG is the largest sportswear manufacturer in Europe and the second largest in the world. The Adidas Group's global net sales amounted to about 21.22 billion euros in 2017. In 2014, the North American region of the Adidas Group generated 19 percent of the company's retail net sales. The Adidas Group owns several sporting brands, including Reebok and Taylor Made. Reebok is seen as a cheaper and less of a premium brand. This allows Adidas to release any significant breakthroughs in research and development through the Reebok brand slightly behind the release through Adidas. As a result, they are able to do this cheaper than a lot of the competition. As well as sponsoring individual sports personalities like David Beckham and Damian Lillard, Adidas also sponsors major organizations such as FIFA and UEFA competitions, the NBA and the Olympics. By making these actions, Adidas increases their product awareness globally and raises its customer base; maintaining its appeal as one of the most valuable sports business brands in the world. Number of employees at year-end.